I write this letter in recommendation Sam Capps and Capps Custom Woodworks. 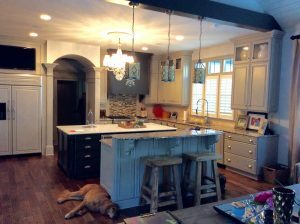 I had the pleasure of working with Mr. Capps on our kitchen renovation recently. I can recommend him highly and without reservation. Throughout the course of our project and renovations in our home, Mr. Capps was a consummate professional. He was accurate in his initial assessment of the scale and cost of our project. He was absolutely clear in his communication of project logistics, materials needed, pricing and project timelines. Our jobs were completed on time and with care and precision. Mr. Capps prides himself on high quality work and always takes the time to do the job right! I would recommend Sam to anyone searching for ethical, hard working, high quality contractors for a project or projects. The workmanship and quality was unsurpassed. I would use Sam and his staff again to design and build my dream kitchen. Sam Capps has completed several projects around our home and I couldn’t be more pleased. He build us a custom buffet which houses a wine cabinet and butcher block top….it’s beautiful. He has also turned unusable laundry room space into drawers for shoes, hats, and “things.” It made our laundry room much more functional and family friendly. I would highly recommend Sam! Sam Capp was recommended to me by my granite guy. I was told I’d be blown away with the quality of his work. Sam met with myself and my wife and we reviewed what we had designed for our kitchen. Sam made some very useful suggestions and delivered an absolutely incredible product. When it’s time to remodel our master bath and closet, I’ll be using Sam Capp again, no doubt about it. Excellent work! I have had Sam Capps do new construction work on my home as well as several remodel/updates to custom cabinetry. The work has always been 1st class, fairly priced and completed in a timely fashion. I have used Sam for 6-7 years and always find him knowledgeable, punctual and cheerful. I have a small kitchen and bath remodeling business, and his work enhances my own finished product for my clients. He pays attention to detail, asks the right questions, and stays on track. His delivery of finished product is on time, and the quality of his work is always exceptional. I recommend him to any and all!